I admit that when I saw the publicity photos of the young cast I wondered if I was in for a soft centred version of a dark book. I needn't have worried. In this production the darkness is all pervading. This Heathcliff and Cathy are wild beasts from the start, the way prepared for them by the sounds of wind and storm that echo around the auditorium as the audience take their seats. The pace is ferocious. Director Mark Babych rarely lets his cast stay still. Designer Hannah Clark's sloped and bumpy moorland, complete with tree, fireplace and chair, allows for the pace and, together with Ciaran Bagnall's superb lighting, melds inside and outside into an atmospheric whole. Lucy Gough's excellent adaptation incorporates both halves of the book so that the later generation become characters as strong as the central couple. It also means that the theme of love calling from beyond the grave can take on full force. 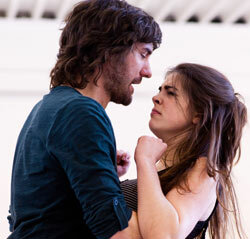 Robert Vernon is an astonishingly powerful Heathcliff, violent yet charismatic, bullying yet vulnerable. This is a Heathcliff who visibly affects every other character. Rosie Holt matches him for animal magnetism as Cathy Earnshaw while Jessica Guise's Cathy Linton shows herself to be her dead mother's daughter as much as her father's. Mark Knightly gives Edgar Linton a strength that makes him more than simply a polite foil to Heathcliff's savagery. Gina Dennett's Isabella is the perfect victim of a mistaken love but she really comes into her own as Linton, the even weaker-willed son of an unholy alliance, a lovely performance. Francois Pandolfo burns resentment in his two generational roles. At the (almost) still centre of all this wildness is Jenny Livsey's superb Nelly, the seemingly calm housekeeper who subtly hints at her own manipulative agenda. As befits a production of such ferocity the actual fights are outstanding. Fight director Kate Waters has encouraged her actors to go at it with such will that there are moments when you really fear for their safety and the impact is all the greater for it. I don't remember ever seeing a production where emotions are kept so high and nerve ends so raw from start to finish without it becoming wearysome. It's terrific theatre which is completely true to the essence of the book.